After reading Meg Jensen's Hidden , I've been dying to get my hands on more YA dragon fiction. Today's featured book looks like a winner! 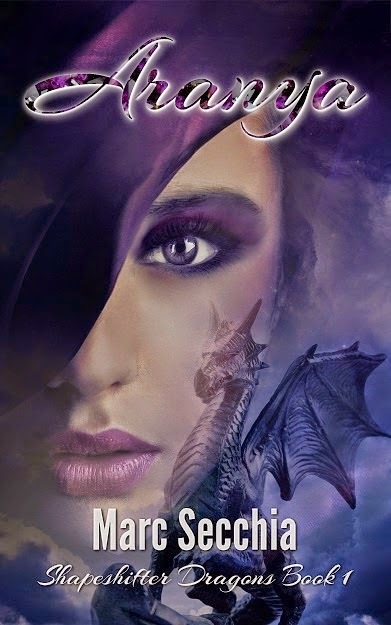 Aranya is book 1 of the Shapeshifter Dragons series by Marc Secchia. It was released just a month ago and is already a best seller! Make sure you check out the excerpt at the end of this post. Quotable quote: "Still lay the Island-Wold beneath the whisper of a Dragon's wings"
Marc is a South African-born author who lives and works in Ethiopia with his wife and 4 children, 2 dogs, a rabbit, and a variable number of marabou storks that roost on the acacia trees out back. On a good night there are also hyenas patrolling the back fence. When he's not writing about Africa Marc can be found travelling to remote locations. He thinks there's nothing better than standing on a mountaintop wondering what lies over the next horizon. He demonstrated with his arms–for the tenth time, Aranya thought, crossly. The real problem lay between her ears, precisely as he said, in her inability to disassociate her Human brain from the business of flying. Don’t think. Just fly. Easy as breathing. She followed his instructions yet again, showing the maximum extent of her incredibly flexible wing joints. She made her wing tips touch together ahead of her nose, then way above her back, before spreading her wings to their maximum extent, her struts straining and her muscles quivering as she held the required position. Aranya glanced between them. They were so familiar with Dragons. So experienced. Nothing about Dragon-Aranya seemed to surprise Nak and Oyda. It was hard to believe that the rest of the Island-World did not feel the same way. “Thinking is precisely the problem around here,” Nak interrupted.